In a small bowl, combine marinade ingredients. Trim flank steak of fat and place in a shallow baking dish. Pour marinade over steak, turning steak to coat evenly. Cover and refrigerate for at least 4 hours or overnight. Prepare a charcoal or gas fire. Remove steak from marinade, pat dry, and discard marinade. Grill steak to desired doneness, approximately 5-6 minutes per side for medium rare, brushing each side with Maple Chipotle Grille Sauce (may substitute with a different Stonewall Kitchen Grille Sauce). Allow steak to rest 5 minutes before slicing. Cut thin slices of steak against the grain and at an angle. 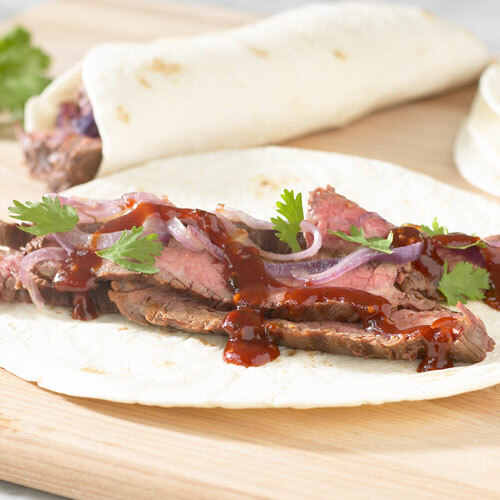 Serve flank steak rolled up in a piece of warmed flatbread with a spoonful of grilled onions, a sprinkling of cilantro leaves, and a final drizzle of Maple Chipotle Grille Sauce.